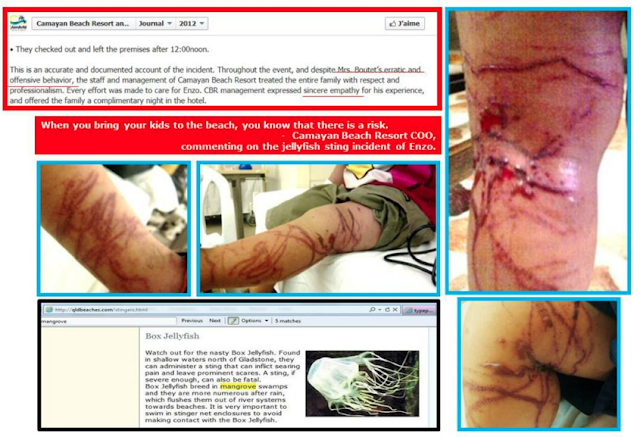 What happens and what to do if you get stung by a box jellyfish? Just the slightest touch from a box jellyfish tentacle causes instantaneous excruciating pain. The victim will almost always scream in agony. Critically, you have a minute or two, if not seconds, in the heat of the moment to treat the victim or the consequences could be fatal. Delay could mean death. Call for help and for some vinegar while getting the victim out of the water. Stay calm and focus on keeping the victim calm. Do not under any circumstances touch the tentacles or try and remove them. 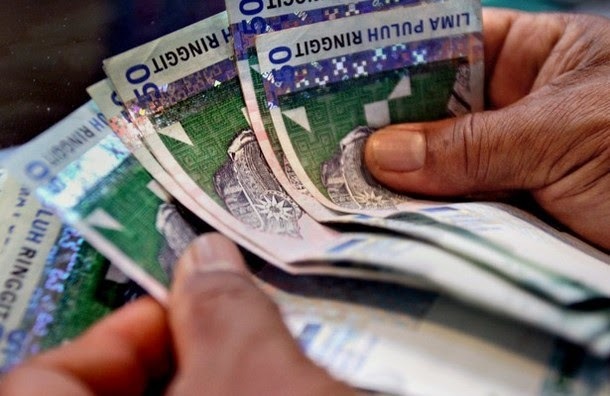 Doing this will only trigger a chemical reaction that injects more venom into the bloodstream. Box jellyfish venom acts rapidly and within seconds of being stung the heart and breathing can both stop. If the victim loses consciousness and vital signs cease, start CPR immediately. Apply vinegar to the sting areas as soon as possible. Again, do not delay. Vinegar contains acetic acid that neutralises the tentacles' stinging cells. Essentially it stops the tentacles from shooting venom into the body. It does not relieve pain. Pour the vinegar onto the tentacles and sting areas for at least 30 seconds. All the while continuing CPR if necessary, and requesting medical assistance. WARNING: Do not use fresh water or ice. Do not try and scape off the tentacles with sand or a card or anything. These will only make it worse, much worse. Urine and cola are not effective. 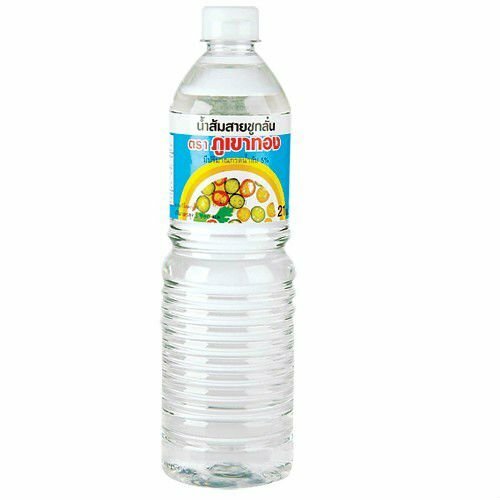 Vinegar or น้ำส้มสายชู (nam-som-sy-choo) is readily used and available in most of South-East Asia including known box jellyfish habitats in the Philippines, Malaysia, Cambodia and Indonesia. It is used in cooking and will be stocked in beachside restaurants and cafes. 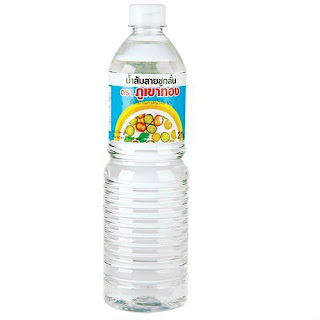 It is also sold in shops and minimarts. Some select Thai beaches have dangerous jellyfish warning signs and vinegar poles. Unfortunately the vinegar bottles stored in the poles are often stolen and not replaced. However, if there is a box jellyfish emergency you can get hold of some vinegar quickly, and you will need to. Even better, be prepared and before you go to the beach or on a boat buy a bottle of vinegar. It is cheap. Place it in your beach bag, let your friends know it is there, and if you never use it - great! Give it to someone else before you depart. As box jellyfish are almost transparent and difficult to identify, and with the speed in which a sting occurs, it is virtually impossible to determine what type of jellyfish was involved. The best approach is to assume the worst and treat the sting as though it was a box jellyfish, even if it was not. 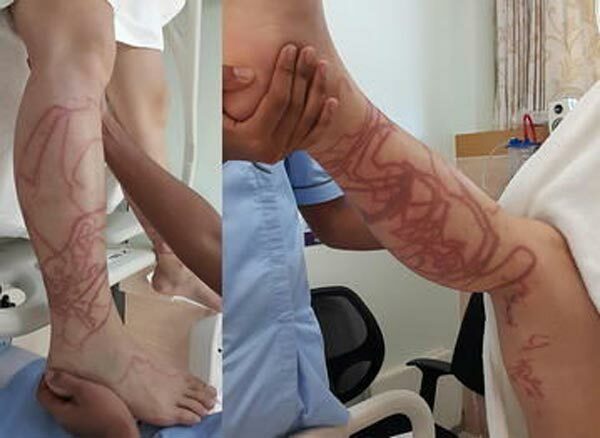 A Chironex-type box jellyfish (multi-tentacle species) sting creates whip-like marks and horrible pain while an Irukandji (single-tentacle box jellyfish) sting is barely noticeable and the effects of the venom may not be felt for around 20 minutes. Other jellyfish stings can range from an instant burning sensation to a mild, irritable rash. If stung by any jellyfish act fast because you may not know exactly what hit you. Only after the vinegar has been poured over the sting areas can the tentacles be touched and removed. The best way to do this is to wash the area with seawater that will dislodge some tentacle fragments and also to use tweezers or the tips of the fingers to carefully remove them from the skin. 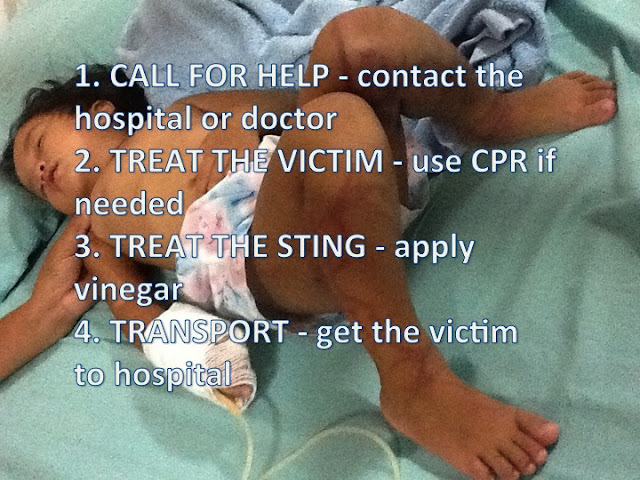 Get the victim to a hospital or medical clinic as soon as possible. Car, motorbike, taxi, ambulance, whatever - move! 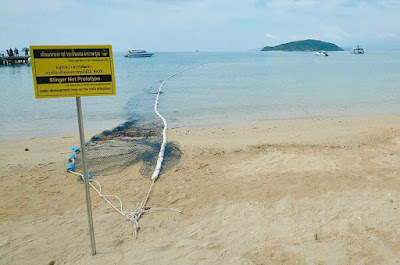 Thailand's Ministry of Public Health has been providing effective education and training for years and doctors are well informed and prepared to treat box jellyfish sting patients. The bottom line with all jellyfish is that they are to be avoided at all costs. They inhabit coastal Thailand and numerous other South-East Asian countries and bumping into one - as they don't attack - is the most likely form of contact. The best way to avoid contact is to cover up when in seas known or suspected to be habitat. While regular clothing could do the job, it usually flops around in the water and provides openings for tentacles and tiny animals. As mentioned in previous posts, lotions and creams have not been proven to protect against lethal box jellyfish but what has been successfully scientifically tested are stinger or lycra suits. Full length stinger suits provide excellent coverage and protection from stinging tentacles and harmful UV rays. The tentacles find the lycra 'distasteful' and the animal soon peels off without firing its stinging cells (nematocysts). Stinger suits have dramatically reduced stings in tropical Australia where they are becoming increasingly common on beaches during the stinger season. Fashion and ego are a problem as many think that suits look ridiculous and prevent a suntan. Few Europeans starved of sunshine would prefer to wear a stinger suit while on the beach of a beautiful tropical island in Thailand but the truth is they don't need to. All you need to do is wear as little as you like while tanning or playing on the sand, then when you want to swim, slip a suit over your bikini or bathers - much like a SCUBA diver would. Swim safely and when exiting the water, remove the suit and continue working on that trophy tan. Too easy! In Australia, this practice is becoming second nature. Even in cooler temperate areas of the country, families are wearing lycra shirts and long board shorts to protect from the sun. It's a habit that caught on quickly and ultimately became a fashion statement courtesy of Quicksilver, Billabong and others - the same could easily come of stinger suits. Even if you think you don't need to wear a stinger suit in Thailand or other countries known to have dangerous jellyfish at least put your children in one as it protects from all jellyfish, sea lice and of course the sun. There's a lot to say about stinger suits and marine biologists have written scientific papers on them. You will not see a marine biologist enter tropical seas without a suit. You now know why. 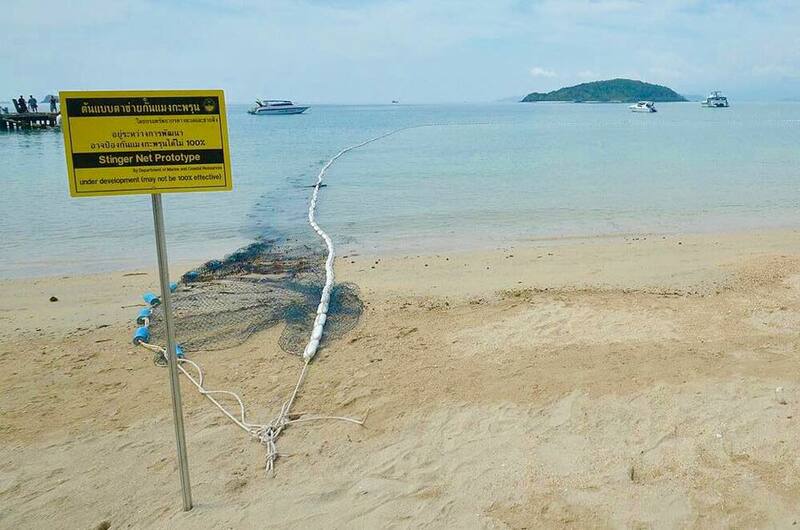 Nets in Australia are also excellent prevention and in 2017 several nets were employed in Thailand. They are prototypes so are in a trial period. On Koh Samui there is one installed on Chaweng beach and one at Lamai. 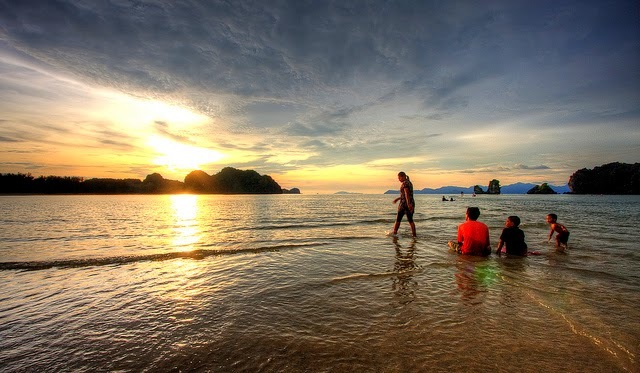 There is also one on Koh Phangan and on Koh Mak. Post-sting treatment is very important. After around 5 minutes if the sting victim is alive then thankfully they have passed the critical period and survived. The real danger period is the first few minutes when the venom has reached the heart. The victim must be kept alive in this critical phase. When the stinging cells have been neutralised by at least 30 seconds of splashing vinegar on the sting site, the tentacles can be removed by washing with sea water (not fresh water or ice) and be carefully picked off with tweezers or finger tips. Once all vital signs are positive, the victim must be taken to hospital or a medical clinic. Pain can be managed immersing the area in hot water (< 46 degrees) but this is obviously risky in a stressful situation with the potential of scalding and burns. 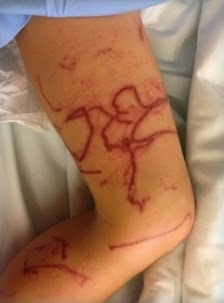 Note that the pain of a jellyfish sting will not kill the victim. Hospital treatment usually involves an IV drip, penicillin, antihistamine and a few days of observation. There is the possibility of the wounds becoming infected and of a secondary infection. Treating the sting wounds as if they are burns is advisable. 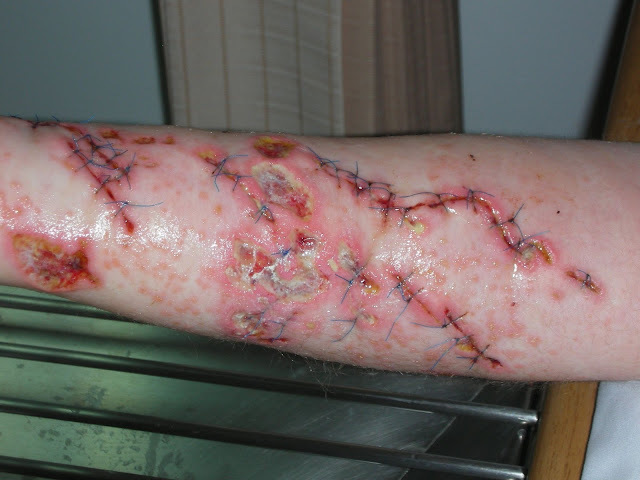 Apply antibiotic ointment and cover with sterile, nonstick gauze to prevent infection and help the skin heal. Vitamin E oil is said to be helpful in minimising scarring.